Colonial Heritage combines southern charm with modern amenities. Virginia has over 90 active adult communities that span from the mountains to the Piedmont to the shore. The 55+ communities across the state are varied, but the most popular have over 900 homes and the resort-style amenities that many people have come to associate with age-restricted communities. They are also located in the Eastern part of the state, from the D.C. suburbs to Richmond and the greater Virginia Beach area. Here are the five most popular communities in Virginia for 2018, based on pageviews to 55places.com. Colonial Heritage has colonial charm. Located in Williamsburg, the gated community takes on a historical feel. Residents may feel like they are living in Thomas Jefferson’s Monticello while at the Colonial architecture-inspired Heritage Clubhouse. The 25,000 square-foot building includes a large ballroom, a library, and dining room. Resident can enjoy social activities, classes, and clubs in the arts and crafts studio, woodworking shop, or the billiard room. The separate Athletic Club includes an indoor and outdoor pool, fitness center, and aerobics studio. Outside residents can stay fit on the 18-hole golf course, tennis courts, and walking trails. This large community is home to 1,800 residences, including attached and single-family homes. Located in the Dulles corridor near Dulles International Airport, Potomac Green is the second most-popular community in Virginia. This Northern Virginia location means the community has easy access to both Washington, D.C., the Shenandoah Valley, and the Blue Ridge Mountains. The community of 1,400 homes centers around the clubhouse, a 29,000 square-foot social and gathering space. The state-of-the-art fitness center includes a large gym area with exercise equipment, an indoor track and exercise area, an aerobics studio, a hot tub spa, and indoor and outdoor pools. Outside, residents can exercise and socialize on the tennis, bocce ball, or volleyball courts, or simply take a walk in the lush greenery of the community. With clubs, game nights, social activities, and classes, residents can get to know each other well. Although residents can choose from condos, attached, and single-family homes, homes are only offered for resale. Heritage Hunt is a large community of almost 2,000 homes located in Prince William County. This part of Northern Virginia is scenic and has a rural feel, but still has easy access to the amenities of the Washington, D.C. suburbs. Like the other popular communities on this list, Heritage Hunt has almost anything residents could want. Three separate clubhouses offer ample space for residents to exercise, socialize, and gather. Staying active is easy on the golf course, tennis courts, or in the pools and fitness center, while residents use the card rooms, meeting rooms, and billiard rooms for club meetings and activities. Homes models include condos, attached, and single-family homes. Prospective residents can choose from homes offered for resale. Celebrate is located about half-way between Washington, D.C. and Richmond in Fredericksburg. This popular community is currently being built by Del Webb with plans for over 1,100 homes upon completion. The centerpiece of the community is the Riverside Lodge. This clubhouse faces a magnificent outdoor pool and tennis courts, with another pool and fitness center inside. Residents enjoy the outdoors, walking and biking on trails, growing vegetables and flowers in the community garden, and taking in nature at nearby parks. Residents can also spend time with neighbors in a variety of planned or impromptu activities and social events. Last on the list - and the smallest community - is The Villages at West Neck. By most standards it is not a small community, with almost 1,000 single-family homes and condominiums offered for resale in eight neighborhoods. The proximity to Virginia Beach may be what makes this community popular, or it might be the vast amenities of the community. 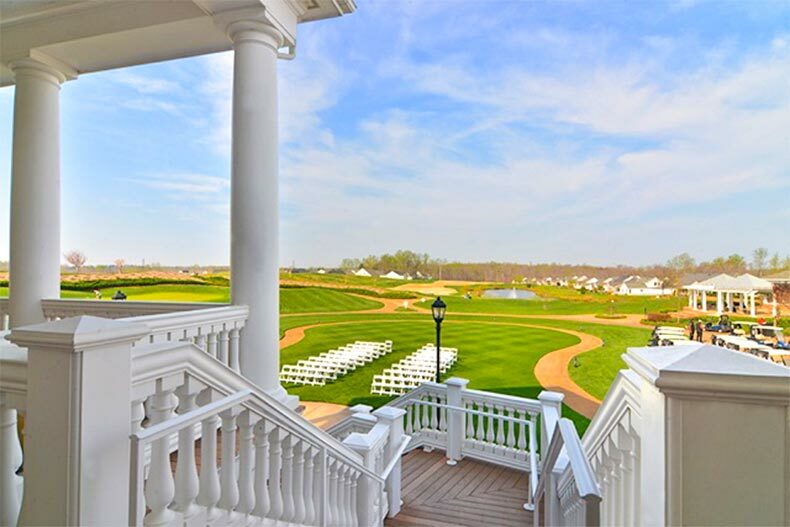 The Signature at West Neck is a country club and an Arnold Palmer Signature 18-hole golf course. The West Neck Village Hall includes a fitness center, outdoor pool, and many spaces where residents can learn, take classes, or join one of the many clubs in the community.